In a recent conference to detail Nintendo’s Q3 financial results, Nintendo president Satoru Iwata mused on the subject of the firm’s hardware development and industry expectations on when, perhaps, the Nintendo DS will step aside for a new portable. Iwata, however, claimed that Nintendo has thrown the traditional four-year cycle for new hardware out of the window in favour of a more inflexible approach. 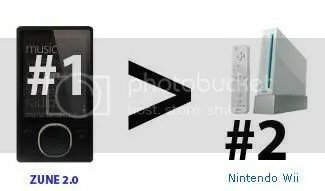 The DS, he inferred, was still offering up innovation, so it’s place in the forefront of Nintendo’s mind is still secured. Forget the Red Sox, Zune has just won CNet’s most wanted gadget poll. The new Zune has rocketed to the top of the pack weeks before the November 13th launch. Word is getting our about the larger glass LCD screen and thinner, smaller size of the Zune 80. Microsoft has invested heavily in R&D to make sure Zune defeats the competition in every aspect. A 27% reduction in size leaves the Zune lighter than the 80gb iPod and it’s still scratch resistant. Existing Zune owners are prepared to receive, free of charge, new Zune 2 firmware features including wireless Wifi sync and 1 click podcast subscription.